After waiting hours, 7pm finally came around and Patient Transfer arrived to take me to the new hospital. Both guys were lovely and I said goodbye to my husband and nurse and was taken to the van. We seemed to get to Royal Melbourne quickly and then came the hours long wait in emergency before we finally got to go up to the ward. The CCU ward was different to Sunshine. 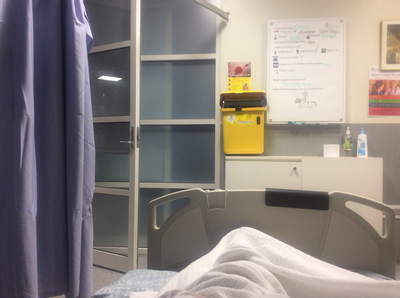 Lots of glass walls but I had a room to myself and the nurses settled me in quickly. Early the next morning I was prepped for my procedure. I was scared and so anxious but I really wanted this to end my problem. Mum and my husband were there to be with me, each planning to go into the city to amuse themselves for a few hours while I was worked on. The prep area was full of doctors and nurses who would be involved. The artery cannula hurt so much being put in but it was happening. I don't remember much once I was wheeled into the procedure room as I was given an anaesthetic. 4 hours later I awoke in recovery to overhear a nurse telling someone it had not been successful. I was so upset. It wasn't until I got back to my room and saw my husband that he explained what had happened. The specialists had not been able to induce a rythym so could only go off ECG data and stress test to ablate areas that may be a focus. This was all done on the right side. Recovery from the general anaesthetic was hard. You can't move your leg for 4 hours as they go through the groin. I felt sick, had reflux, not much pain in the chest but so uncomfortable. I was so happy to finally move my leg. My specialist came to see us and I was so devastated that the procedure hadn't gone to plan. The next step was to do a stress test and see what the result was. This was booked for Monday. The weekend was long as I tried to get my head around the fact that my dream scenario wasn't going to happen. I had been visited by psychiatrists and talked my feelings through but was so anxious I needed diazepam to take the edge off. Monday finally came and my Dad was with me when I was collected for the test. I again felt strange that I really wanted this test to fail so I wouldn't be sent home with medicine change. Dr Morton was with me for the test. After being connected to all the cords, the test started. It only went for 4 minutes before it was stopped. I saw on the monitor that I had strange beats and Dr Morton talked me through what he was seeing. The extra beats were still happening close together but he could now see that they were all coming from the same side, which was now the left. He took off all the cords and told me to go back to my room and he'd meet me there. Dad was happy to see me and I told him the doctor would be there soon. Dr Morton came in and explained that he now wanted to do a second ablasion as he was confident he could see a significant focus on the left of the heart. I was so happy to hear this. Another shot. It may happen on Wednesday or Friday if an anaesthetist was available. Well the procedure didn't happen in week 2. 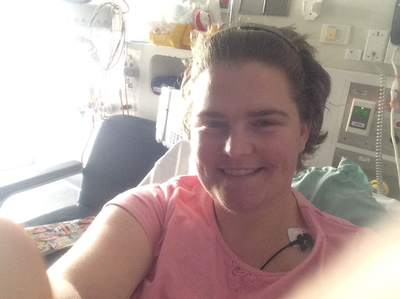 I had to be shifted from my room and was put in a shared room at the end of the ward. Mum was with me when I was shifted. I was ok to be moved but when I realised how far I was from the nurses station I started to panic. I was not happy at all but tried to put on a brave face for Mum. By the time my hubby arrived I was upset and asked the nurses to please move me closer. The feeling of panic was overwhelming. I went from constant visual of the staff to stuck in the room furtherest from the nurses. After dinner I was shifted to a single room across from the nurse desk. It was a small room with no windows but I felt safer. I had several visitors over the weekend to keep me busy and the weekend went by pretty quick. Henry came to see me which cheered me up. He loves to play with the water so we're saving all the little milk bottles for his cubby house! Early Monday morning came along and I had to be shifted again as a high risk patient had come in. I didn't have an issue moving as long as I was close which I was so I was happy. My doctor came came to see me in the morning and reported that Wednesday would be my second ablasion. I was happy with that. My mum and husband visited me and I had a new roommate from Shepparton. I had signed all the paperwork for the procedure when Tuesday night came around. The cardiac doctor on the ward walked into my room with a disappointed look on his face and I knew something was wrong. He proceeded to tell us that there had been a break down in the lab they needed and my procedure was going to be cancelled til the next week. My brother and mum were with me and I couldn't help it but to burst into tears. I had psyched myself up and now it wasn't happening. I'm glad they were there to talk me through it. I said to them I was more disappointed as now I'd have to be disturbed by the US election! After awhile I said goodnight to mum and settled to bed calmer than before. 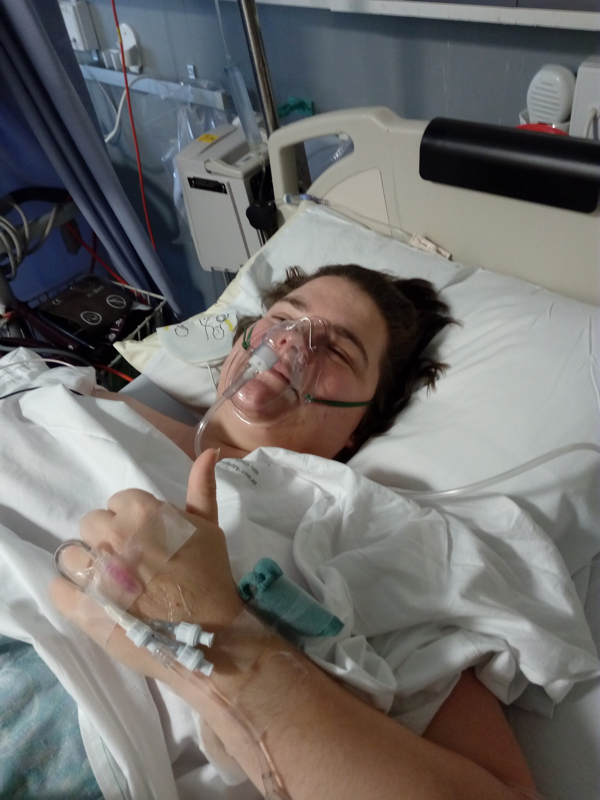 After a few days of waiting and dealing with anxiety and fear Friday came around and this was the day I was on the procedure list. Wasn't until the afternoon so I was not allowed to eat or drink after breaky. Visits from the doctors reassured me and finally the time centre. My husband was with me and gave him a big hug and kiss as I was wheeled off to the lab. The anaesthetist again had problems trying to get needles in. I counted that I had received at least 50+ needles over my whole hospital stay so far! In the end I was wheeled in to the lab and transferred to the operating table. The preparation was pretty intense. I seemed to be awake for all of this this time around. I had several monitoring stickers placed on me, defibrillator pads, heart mapping devices stuck on and something stuck on my head that monitored my sleep. You have no dignity in hospital! Everyone just does their job and nothing seems to faze them. My body was covered in a blanket and warm air was pumped under the blanket from my feet. Not long after that I was given a sedative injection and fell off to sleep. When I next woke, about 4 hours had passed and I was in recovery. It was around 7 o'clock at night. Once I was awake I was wheeled back to my room. I heard the staff say the procedure had been a success. I felt happy but knew I had to wait for my doctor. Pete was happy to see me and had talked to Dr Wong and Dr Moreton so repeated this information to me. We learnt that through medication they had induced a VF rythym which was the same rythym as my arrest and I had to be shocked out of it. It sounds weird to say but this was a great result as they had such good data of where to target. They had said it went well and were happy that they had got a focus area but would need to wait for the stress test to know for sure. Pete had to go soon after and I had to wait 4 hours before I could move my leg. It's such a long wait. I didn't have any pain or reflux so felt good about that. Finally the 4 hours was up and I could stretch and get up to go to the bathroom! The weekend was filled with visitors to distract me, including Henry who keeps me entertained. I didn't seem to take as long to recover from this procedure which made me feel positive. Monday arrived which was the day of my stress test. This would show if the procedure had gone to plan and been a success. It wasn't until late afternoon after my specialist had visited to discover I still hadn't had the test that a technician arrived to take me. I again was so nervous and so worried that this would fail. I was told if this test failed I would be on a much stronger medication that had significant side effects. Dr Wong was present for this test and it wasn't long before all the cords were in place and I was hooked up ready to go. The test started and I watched the screen closely as did the doctor. It starts off a slow pace on a slight incline and every 3 minutes it lifts up and goes faster. I regularly asked if anything could be seen but Dr Wong reassured me that all was fine. About 8.5 minutes passed and I was so tired and my legs hurt! It was the most exercise I had done in 5 weeks! The test stopped and I started my recovery. This is usually the time that the beats showed up so I was really scared. But nothing happened. I was so sure it would be bad but the Dr was really happy. I was taken back to my room and my doctor went to talk with Dr Morton on the phone. When he came back he was happy, he said Dr Moreton was delighted with the result. Such positive language. The test had shown that no extra beats were present in any stage of the test. Previous tests had shown issues very early on in the test and I could feel it in recovery. All my tests had been done off medication. I was so happy. I was teary, but happy teary. I rang my husband but got no answer, so rang my mum and got to talk to her. She was so happy. She was looking after my son so we FaceTimed. Very happy conversation. She told me dad was at an awards ceremony so I rang him to spread the good news. He was in tears and so happy. My husband arrived at 5 o'clock and as soon as I saw him I burst into tears and we hugged for a long time. He was teary and all I could say was 'it worked'. They were tears of relief. He stayed with me awhile and I tried to tell him everything I could remember from the test and we just talked. I couldn't believe it had worked. Visiting hours came to an end and I had to say goodnight. It wasn't long after that, that the doubt started to creep in. What if it came back? What if it came back the next day? How long will it last? The questions were endless and it wasn't long before my happy mood disappeared and I was back to anxious and scared. The nurses were happy for me and people started to discuss discharge. My specialist didn't want to rush so it was looking like Wednesday. I was back on my meds and Tuesday was to be spent being monitored to check if anything popped up 24 hours after my procedure. Pretty lazy day but I was still very cautious. I had a roommate that was Ethiopian who didn't speak English. I talked to her daughter a fair bit and she always checked on me. I had the same discharge day as her mum so there was lots of health professionals visiting our room. Wednesday arrived and this was discharge day. After exactly 5 weeks in hospital, I was going home. My husband was so excited and happy. He arrived early to try to be there for the pharmacist, doctor and anyone else who came to see me. Discharge seemed to come around quickly. Dr Morton came to see me but he didn't have the same positive tone as Dr Wong. I couldn't help but get upset after he left. I was after a more positive message and he didn't deliver. This set the tone for my morning. My anxiety was building and everything upset me. The hospital psychologist came to check on me one last time and we had a good chat. I told her I was really frightened and we discussed different things for me to try. She also made sure I had an appointment booked outside of hospital. Pharmacy came and talked me through all my medication and once we were given the medical certificate, I was told it was ok to go. Peter was so excited but I suddenly felt panicky and didn't want to go, I felt unsettled and asked for blood pressure to be taken. My cheeks felt tingly and I was so nervous. I went from 24/7 monitoring to having nothing on me and I was overwhelmed with fear. I asked for the doctor to come and see me and one of the ward doctors came to talk. He asked what was wrong and through my tears I said I needed some reassurance. He had a calm tone about him, and reassured me that they were all really happy and they had no suspicion that something would go wrong. This made me feel better and I was ready to walk out of my room. Peter took all my bags and we slowly walked out. I was so nervous and the walk to the car seemed to take forever. The drive home was ok and I checked my heart rate regularly. 5 weeks in hospital, medicine change and after two procedures I was told that my dangerous rythym couldn't be found. It seemed such a huge thing to process.